Creamy-white five-petaled flowers with a dark purple-brown dimpled centers bloom abundantly. A showy vine perfect for window boxes as it trails agreeably, but also climbs trellis work. Once called Winged Thunbergia, the white selection was noted as rare in Curtis's Botanical Magazine in 1836. Tolerates humid heat. Chartreuse green buds open wide into handsome, creamy white flowers flushed with the palest of green tints. The flowers are lovely grown on trellises and arbors, blooming from midsummer until hard freeze. Listed in an 1897 catalog! This long-loved vine has acquired many names, including Love in a Puff, heart seed and balloon vine--all very accurate descriptions of this delightful variety. Buoyant light green inflated seed capsules follow the small white flowers. Inside each capsule reside three seeds, each marked with a perfect white heart. 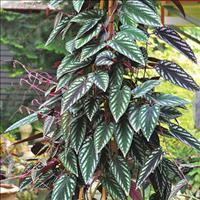 The delicate, finely cut leaves are borne on stems that reach 10-12'. Grown in the early 1800s.